You know the saying about losing your muscles if you don’t use them? It’s the same sort of thing with marriages. If you stop working at them, it’s easy for them to lose their strength. That’s why it’s so important to make them a priority. Now, don’t get me wrong, I love being married to my husband, but between work and the kids and other responsibilities, it’s not always easy to put our marriage first. However, there are five things that we’ve vowed not to compromise on because they’re like the workout of our marriage. They build us up, help us grow closer to one another, and keep our marriage strong. From communicating about the bills that are due to what’s going on at work to concerns about the kids, we try to always keep each other in the know. That means a lot of texting and a lot of talking. We’ve learned to keep the texting about mundane things and save the heavy or potentially controversial conversations until we’re in the same room. A lot can be misinterpreted over a text! Once a week, we head out to dinner. It’s our Date Night and it’s important. Now, there are times when the kids are sick or one of us is away on business, but we try to be consistent with our time together. I also really want to model that behavior for our daughters, because I want them to understand that marriage is important and it’s work, but it’s also fun. It doesn’t take a lot of money to have a date with your partner. Here are some of our inexpensive date night ideas. No name calling. No low blows. No purposefully hurtful comments. Sometimes there are disagreements and arguments in marriage, but those times should never result in being disrespectful. 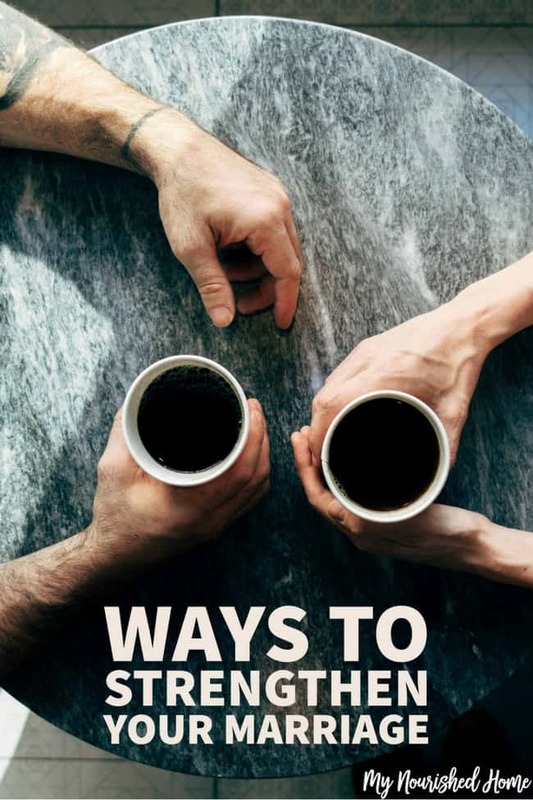 We made an agreement early on in our time together that we can absolutely disagree on things, but we need to be respectful when discussing them. You can’t build a strong marriage when you’re ugly to one another. Sometimes my husband will do something totally out of the blue for me. It might be bringing me flowers for no reason at all or refilling my coffee cup when it’s low. He doesn’t have to do those things, but he does, because he loves me. Those actions make me want to do more for him. When you go out of your way for no reason other than to show how much you love someone, it gives them the warm fuzzy feeling they had when you first started dating. It’s those feelings and those random acts of spousal kindness that help strengthen a marriage. I love having inside jokes with my husband. We can look across the room at each other sometimes and know exactly what the other is thinking. It’s those funny moments, those inside jokes that help us build that strong bond. I think it’s because we’ve got memories attached to those jokes that only the two of us remember. Those shared memories are like the glue that helps hold us together. Work for your marriage every day, but expect there to be ups and downs. Those ups and downs are okay – they’re natural in any relationship. 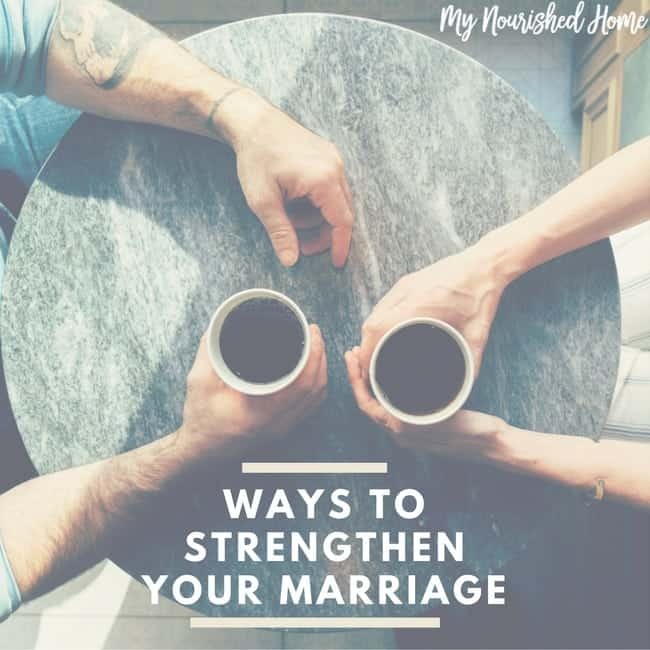 It’s how you overcome the downs that determines how strong your marriage will be. So, go out on a date with one another, joke, laugh, and talk. You deserve a strong, healthy marriage, but you have to put in the work. It’s worth it!